Oculus Rift games are going to be the main driver behind sales of the virtual reality headset, and one of those games likely be the ever-popular "Minecraft for Windows 10." This full 3D edition of Minecraft can be played in both creative and survival modes and will be sold via Microsoft's Windows 10 Store as well as the Oculus store early next year. The Facebook-owned company is planning to launch an Oculus Rift consumer edition around this time, though the Minecraft for Windows 10 in full 3D will also work with the new Samsung Gear VR. We'll have demos of new Oculus content after today's press conference, and tell you what it's like to jump into Minecraft like never before. The Facebook-owned company also announced a mix of very old and new games at its annual conference. Giving it a jumpstart are classic titles from previously established gaming leaders, including Sega, Midway and Bandai Namco. No, Sonic the Hedgehog hasn't been announced - yet. At Oculus Connect 2, there were specifics about new games from modern-day developers, too. The team behind Monument Valley is creating a new VR game called Land's End. Another mobile game making the phone-to-Oculus transition is the smash hit Smash Hit developed by Mediocre (it's not mediocre). 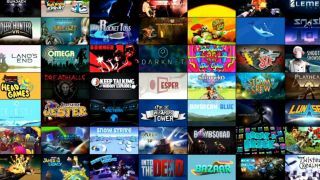 Finally, Oculus briefly showed a tile of new game titles including Darknet, Shooting Showdown 2, Bazaar, Into the Dead and Rocket Toss, all coming to Oculus Rift soon.